Since 2015 we’ve helped thousands of Resellers from across the globe start and grow their businesses with our high-speed cloud platform. You see, I started NameHero because I could not find an affordable web host that offered true high-speed cloud web hosting. You had the large brands such as HostGator, BlueHost, GoDaddy, etc. but all of them offered the same quality Shared/Reseller package on dedicated servers using default software (such as Apache Web Server). In order for me to have true-cloud web hosting that was scalable, I had to physically deploy servers, install software, and then link everything together for the final product. I had this vision of a platform that would allow websites of all sizes the ability to tap into this technology in a simple and affordable way. That was the idea behind NameHero. Once we were live we aggressively began marketing our platform to Reseller Web Hosts. With the ability to launch websites on the cloud without a complicated setup, our Resellers quickly found a competitive advantage that wasn’t yet heard of. In order to really tap into the market we had to really over-simplify to help those without the necessary technical resources or knowledge. We did this by partnering up with WHMCS, the world-leader in web hosting automation. Since mid 2015, all of our Corporate Hero reseller packages have included a complimentary WHMCS license. For those not familiar, WHMCS is a piece of software that you install on your website, link your Reseller account, and then instantly have the ability to have customers signup and provision their web hosting account. WHMCS handles all the technical integrations, payments, invoicing, and even setup emails. It gives Resellers the ability to begin offering web hosting in a matter of hours, without having to spend hours on the backend setting up the logistics. Just think about how much time it would take to generate an invoice, send it to the customer, collect the payment, and then setup their web hosting account! To better educate web designers, WordPress developers, marketing agencies, and other Entrepreneurs we began a series of training here on the NameHero Startup blog to help explain the Reseller Hosting model. Despite the stigma that web hosting is “hard” we try to break it down to where anyone with the desire can easily offer this to their clients. 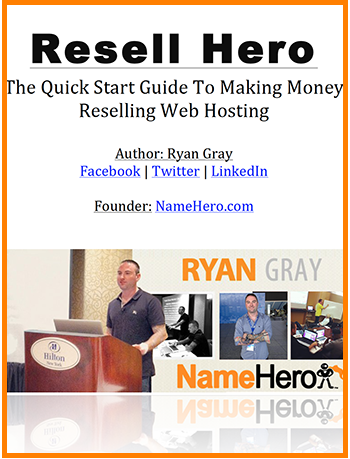 Resell Hero – The Quick Start Guide To Making Money Reselling Web Hosting – I released the first copy of Resell Hero back in 2016 where I break down the Reseller Hosting model step-by-step and explain exactly how the process works. Reseller Hosting 101: How To Start Your Own Web Hosting Business (Free Course) – In the fall of last year I released this video training course. Developed with all experience levels in mind, it’ll walk you through the process of getting your Reseller Hosting business up and running with WHMCS. Both of the above resources will help you make the decision if Reseller Hosting is for you and give you the foundation you need to get started. If you’re already a Reseller Host, it’ll provide some insights on how you can expand your base and grow your company using the NameHero high-speed cloud. Many of our Reseller Hosting customers like to create their “front end” website with WordPress and power the “back end” billing and client interface with WHMCS. This gives them the ability to setup a professional-looking website they can highlight their features to their customers and then use WHMCS to setup the accounts automatically provisioning them and collecting payments. Given the popularity of WordPress, much ease and comfort is found using the same platform to develop their website, while leaving all the back-end stuff to WHMCS. I recently joined forces with WordPress YouTuber Darrel Wilson to film a complete WordPress/WHMCS tutorial that will walk you through the process step-by-step. This is one of the most comprehensive tutorials we’ve filmed and will help everyone that uses / installs WHMCS to ensure a proper setup. The future is very bright for Reseller Hosting and Web Hosting in general. With the recent additions to WordPress, they’re working on transforming from just a content management system, to a full website builder. While I wasn’t a big fan when they announced the new Gutenberg editor, I now see what they’re trying to accomplish, and see the number of possibilities their opening up to their end-users. People who once thought they could never setup a website, now have the ability to not only setup one, but to setup a professionally looking one full of features and functionality. Even with WordPress aside, the need for web hosting has never been larger. The Internet is no longer “a thing” it’s “the thing” and 100% necessary for any business or individual looking to have an online presence. The success stories from our own Resellers have been beyond inspiring and they continue to come from all regions of the world! Leverage our platform to take full advantage of its power and provide your customers with a web hosting experience they would have never even dreamed of! Over the years we’ve had a lot of questions in our ticket desk, live chat, and on the phone, therefore I’ll try to list the most asked ones here. Feel free to use the comments below to ask more and I’ll get them answered as quickly as possible! Does NameHero Provide Support For My Customers? Reseller Hosting gives you the ability to start a 100% white-labeled business. Therefore we’re unable to provide support without your customers seeing us. We also don’t know your customers like you know them, therefore it’s important to offer your own support to meet their exact needs. If you run into a technical issue that you cannot solve, you’re welcome to log a new ticket with us and we’ll help supply you with the solution to your customer’s needs. 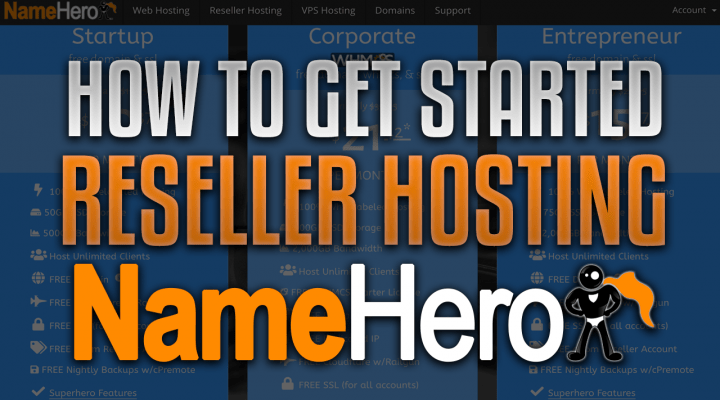 Does NameHero Help Design / Setup My Reseller Hosting Website? No. NameHero provides Reseller Hosting packages meaning we provide you with the infrastructure that you’re reselling to your customers. It’s your responsibility to make your own website and we’ve published hundreds of videos/tutorials on our blog to help make the process as easy as possible! Does NameHero Provide WHMCS Support? As stated in the above tutorial, WHMCS encrypts all of the files to their software. This is done to prevent people from seeing their “magic code” and stealing it to use in another application. Because of this, we’re unable to directly support WHMCS issues outside of the very initial installed (i.e. once your admin area is online). However all of our complimentary WHMCS licenses come with direct support from WHMCS. You can log a ticket with them here. If you’re needing help with configuration and functionality I would recommend getting active in the WHMCS Community. There are thousands of other Resellers (like you) out there that have the solutions to many common issues. Can You Make Money With Reseller Hosting In 2019? I often laugh when people ask if they can make money Reselling Web Hosting. I personally consider web hosting as the “water of the Internet.” Without hosting, there wouldn’t be websites, hence there wouldn’t be an Internet. Simply put, every small business and individual wanting to have a presence online needs a web hosting package. With the NameHero high-speed cloud you have a tremendous selling advantage over other resellers as you’re able to offer a premium hosting product for a very affordable rate. If you take full advantage of this, you’ll be able to obtain customers as long as you’re actively and consistently marketing your services. What Type Of Content Is Prohibited By NameHero Resellers? All NameHero Resellers and customers of our Resellers are bound by our Acceptable Use Policy and Terms of Service. We have a zero tolerance on any material to be considered “adult only” in nature and don’t allow Resellers to offer “free” web hosting. Basically any type of content that could be considered abusive is not allowed. If you have to sit and question it, most likely it’s not allowed :). Can I Copy NameHero’s TOS, AUP, Knowledgebase, etc.? Does NameHero Offer A Money Back Policy? We offer a 30-day money back guarantee on all Web Hosting, Reseller Hosting, and VPS Hosting packages less setup and software fees. You can learn more about these in our Payment Policy. If you wish to cancel your package before the renewal date, you can receive account credit for the funds not used. This post is both EPIC and a Godsend! Thank you! May I ask, if someone wants to buy Reseller hosting, but not wanting to present as a “Web Hosting Company”, but instead provide hosting within website monthly care plans as a Web Developer/Agency model, would you still do all the above steps/processes outlined in this video using WHMCS? I don’t really want to show (or offer) domain registration, and I’m also a bit unsure about the c-panel setup –> this isn’t something that a client would necessarily need or have access to (depending on the type of client I’m building a website for). In this case, would it be the client that signs up through WHMCS, or me (as the Web Designer setting up their plan)? …I’m completely lost on this part of the client setup process! I’m thinking that they would signup to MY monthly maintenance plan (which included the hosting). >I’d set them up on a monthly recurring payment plan (can this be done in WHMCS? Or I can use my current accounting software if not). >Then I would proceed to set up their hosting account in WHMCS/C-panel myself? Are these the right steps…..I’m so confused! >> It’s up to you really. If you’d like to manually add them to WHMCS, you can certainly do that (http://help.whmcs.com/m/installation/l/682009-manually-adding-a-client) and then WHMCS would handle the billing/invoicing going forward. >> Well WHMCS was designed primarily to automate the customer signup/account creation. But you can still tweak the setup of the product where you could manually set it up. >> Yes, WHMCS allows this. Under your package, you’d set this up in the “pricing” tab. >> If you don’t want to use the auto-provision module, you don’t have too. You could manually set it up or manually click provision when they signup. Hope this helps, WHMCS allows you a ton of flexibility to customize your experience. My video tutorial assumes you’re going to be setting up a front facing website to allow instant hosting signup. If you want to get more specific about your setup, it’d prob be beneficial to join the WHMCS community https://whmcs.community/ as lots of other ppl surely have similar setups where they can provide even more input than I can! NameHero == RyanHero for sure! I feel much more confident in going ahead with this now, and those links will really help! I hope (and think) my questions will also help other budding entrepreneurs out there starting out! !